Chris Heenan lives in Los Angeles and Stuttgart, Germany. He plays alto saxophone, bass clarinet, contrabass clarinet and analog synthesizer. Some current projects include Phantom Limb & Bison with electronicist Jaime Fennelly, guitarist Chris Forsyth and Shawn Hansen on EMS Synthi & radio feedback; Team Up, a trio with guitarist Jeremy Drake and a revolving third member percussionist; a duo with Berlin- based percussionist and light artist Michael Vorfeld and a duo with Chris Forsyth. 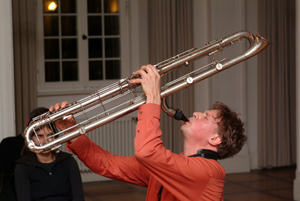 Some current playing partners include trumpeter Birgit Ulher, percussionist Michael Griener, vocalist Ute Wassermann and contrabassist Alexander Frangenheim.